Born from the expertise of Carol Duval-Leroy and her head winemaker, Sandrine Logette-Jardin, the elegant shape of the bottle holds all the charm and grace of a great Champagne. 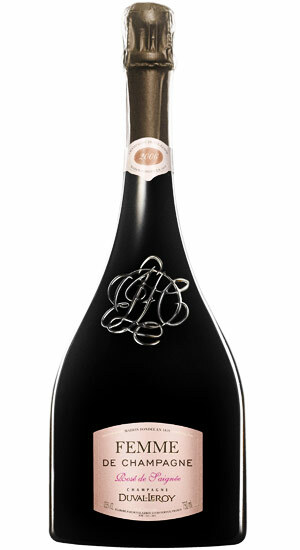 Cuvee Femme de Champagne Rose de Saignee symbolizes the savoir-faire of the House of Duval-Leroy. Only great wines can make great Champagnes; we have selected only the best plots and vinified the grapes using the most demanding methods, without compromise, in order to obtain the purest rose colour and the most delicate of sensations. This bright Grand Cru Vintage 2007 Champagne, with its pink-gold tints, reveals lively, complex notes of ripe fruits on the nose. Beautifully structured, its freshness combines with wild red fruit flavours. This Champagne, with its subtle, seductive personality, displays with passion the style of Duval-Leroy.